Here we are in busy west Ipswich. Ipswich can feel like a town of two parts - the docks and the wide river split the southern half of the town, and the great Christchurch Park cuts in from the northern suburbs right into the town centre. Older townsfolk often identify themselves as either from East or West, and it was unusual historically for people to move from one side to the other. The west side of town is poorer, with acres of 19th Century terraces, and the more recent additions of the challenging Whitton and Whitehouse estates. Suffolk doesn't have many 19th century churches - or, at least, not many that aren't rebuilds of medieval ones. 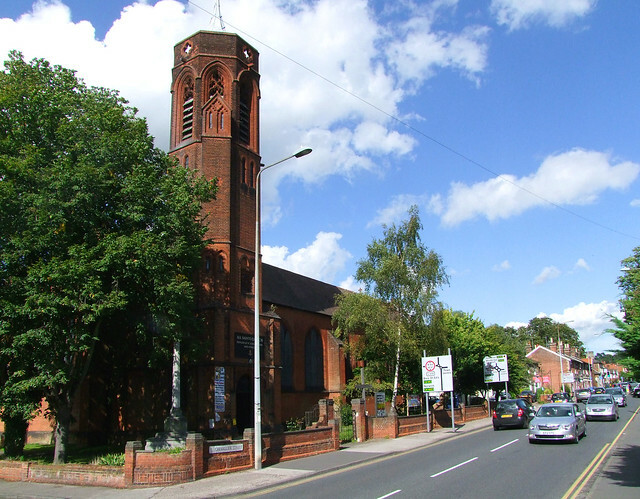 All Saints, then, is something quite unusual for Suffolk, not least because its red brick style is most un-East Anglian, a consequence of the architect being Samuel Wright of Lancashire, who won the 1883 competition. Perhaps he put in a speculatively high bid, and was surprised to get the job. Still, the octagonal tower is vaguely suggestive of Suffolk round ones, and in any case it would be dull if all churches were the same, especially 19th Century ones. The parish was carved out of St Matthew, closer into town. 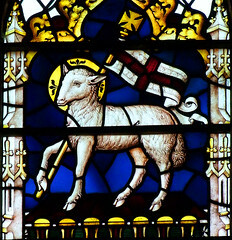 All Saints sits on Chevallier Street, a bottleneck on the Ipswich ring road, and so many drivers every day get to have a really good look at this church. 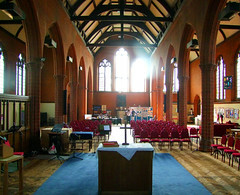 There is a successful mixture of styles, the Decorated details of the tower providing the star of the show, and the Perpendicular aisle windows with their great arches are also not unpleasing, although perhaps odd in that their 'wall of glass' 15th Century style is contradicted by the rather forbidding and severe red brick expanse and high roof. The great east (Dec-style) and west (Perp-style) windows are rather more successful. Stepping inside, the view eastwards through the brick arcades and plain windows of the nave is impressive. All materials, so it is claimed, were produced in the parish. Here we are seeing the language of Early English fluting, for the pillars of the arcades seem impossibly slight to support the great weight above us. In fact, it is a cunning trick, for the arcade is actually constructed of cast iron pillars concealed by brick dressing. It is all very well done. There is a sense of emptiness in the nave which contrasts excitingly with the mystical gloom of the chancel beyond the rood screen. 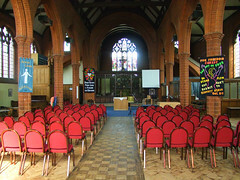 The sanctuary is full of serious colour. This building was designed for Tractarian incense-led worship. 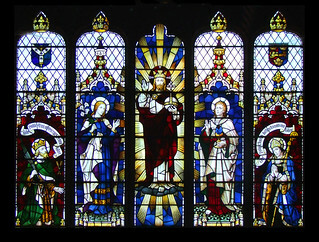 The five-light east window of Christ in Majesty flanked by St Edmund, the Blessed Virgin, St John and St Felix is credited by Pevsner's revising editor to 'Campbell of London', but it is certainly the work of Horace Nicholson (thank you to Aidan McRae Thomson for pointing this out to me). Whoever Campbell may have been, perhaps Nicholson was working for him. 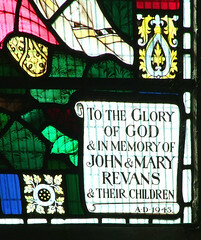 The window dates from 1938, and is in fact the earliest glass here. Perhaps the windows were clear before this. 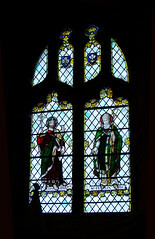 The other two windows are both in the north aisle. That at the east end of 1950,depicting St Edmund and St Felix, is by Horace Nicholson's son, AK Nicholson. 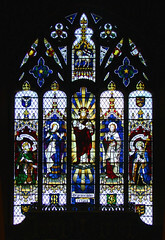 The window at the west end, of 1943, depicts Christ and the children, and is by far the best window in the church. Its artist is unrecorded, but perhaps it is also by AK Nicholson. When the church opened in 1884, a young clergyman from a small village in Kent was appointed as its first minister, a 'curate-in-charge'. His name was Richard Munro Cautley, and his young son Henry would grow up to not only be diocesan architect, but the greatest historian of East Anglia's churches. 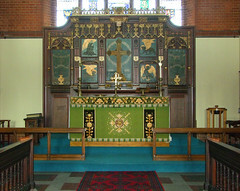 He designed three Ipswich churches, St Augustine, All Hallows and St Andrew, as well as other Ipswich buildings including Ipswich County Library, and the Walk shopping precinct which he designed with his partner Leslie Barefoot. The young Cautley learned the aesthetics and principles of High Anglican worship, and these infuse just about everything he ever built. He was only ever at home in the idiom of the late Middle Ages, and it is a tribute to the work of Samuel Wright of Lancashire that Cautley learned it first here.